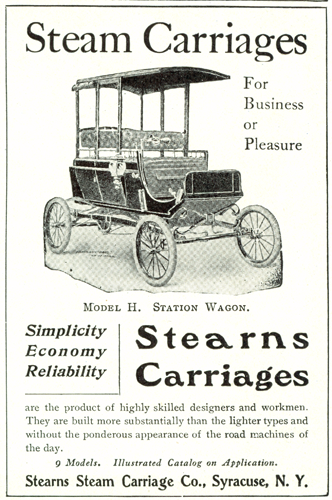 Designed by E. C. Stearns, this car had no connection with the better-known Cleveland-built Stearns. It was a steam car of conventional design using a 2-cylinder, slide-valve engine of 8 hp, chain drive, and steering by side tiller. A wide variety of body styles was offered, including a six-passenger with three rows of seats and roll-down canvas sides. The latter model was introduced in 1902, and has been call, probably correctly, the world's first production station wagon. 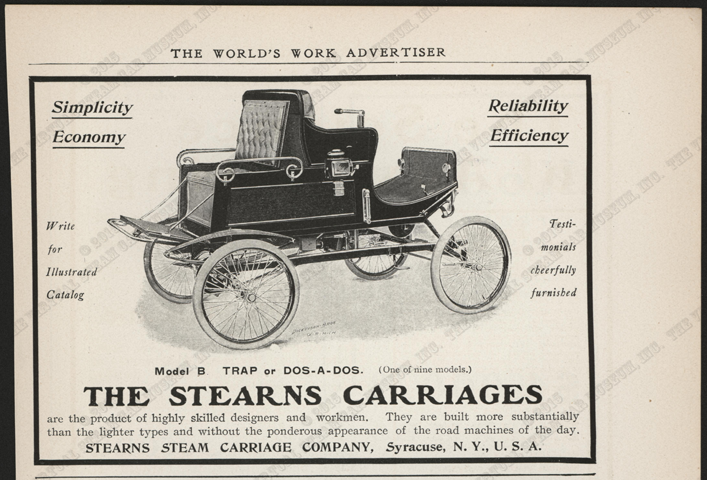 This image of the Stearns Steam Carriage, Model B, the Dos a Dos or Trap, appeared in Harpers Weekly on Marh 8, 1902, page 319. 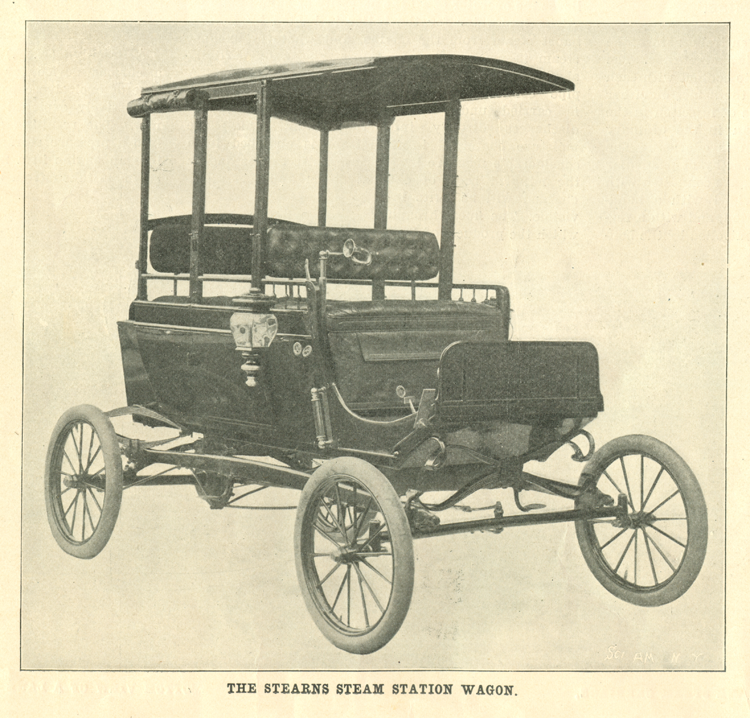 Thiis image of the Stearns SteamStation Wagon appeared in The Scientific American in March 1902. Country Life in America, July 1902, p. lxi. Country Life in America, August, 1902, p. lxxxviii. 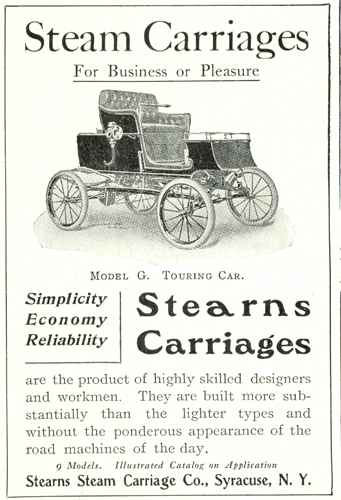 Stearns placed this small advertisement on page 720 of Motor World on September 11, 1902. 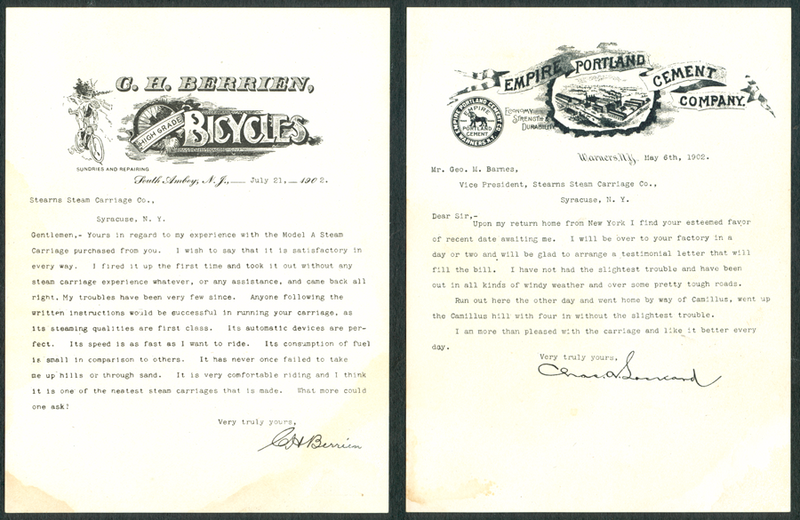 These two advertisements appeared about 1902 in The World's Work Advertiser. Conde Collection. 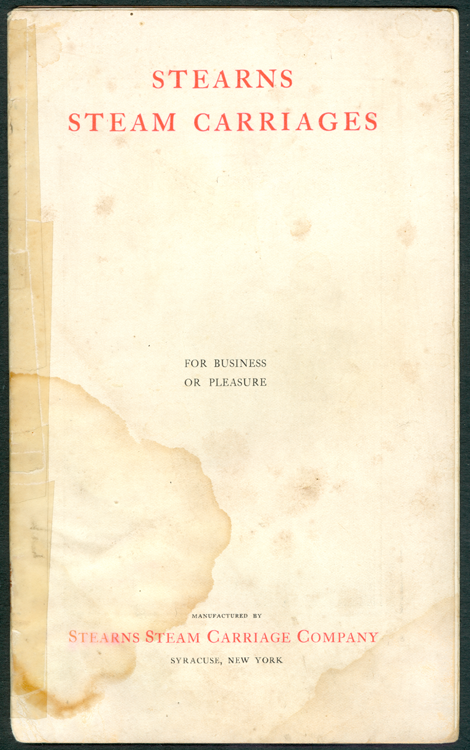 This small, mid-page advertisement promoted the company's nine models and urged readers to write for a catalogue. 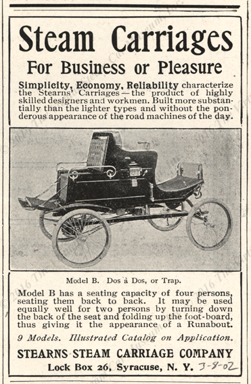 The Automobiel, January 3, 1903. Conde Collection, photocopy. 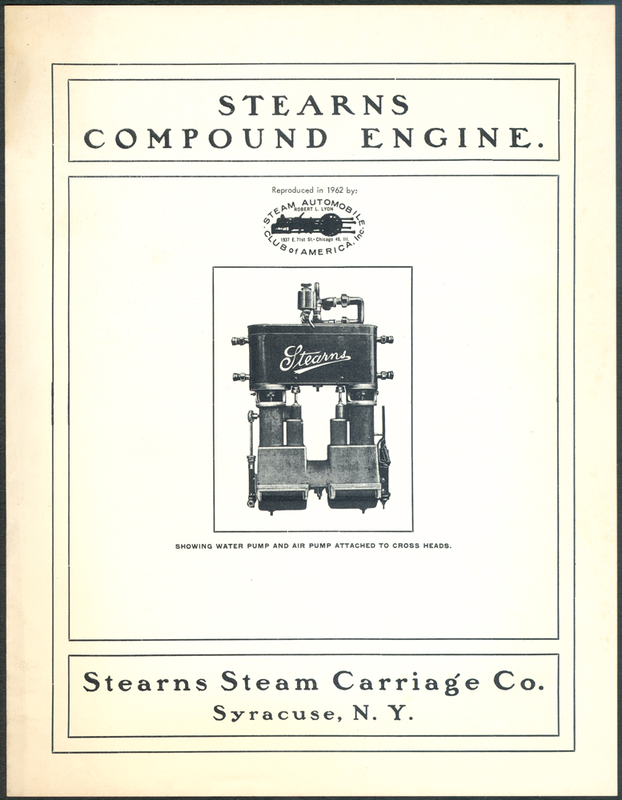 This lapel pin promoted the Stearns Steam Carriage Company. 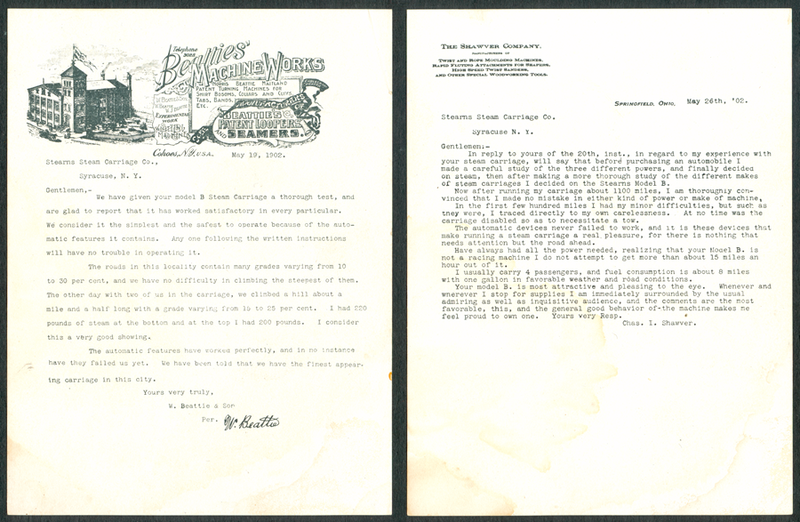 The following material came as a group and is clearly an advertising package from the Stearns Steam Carriage Company to a prospective buyer. Six single-sheet testimonials from happy customers. 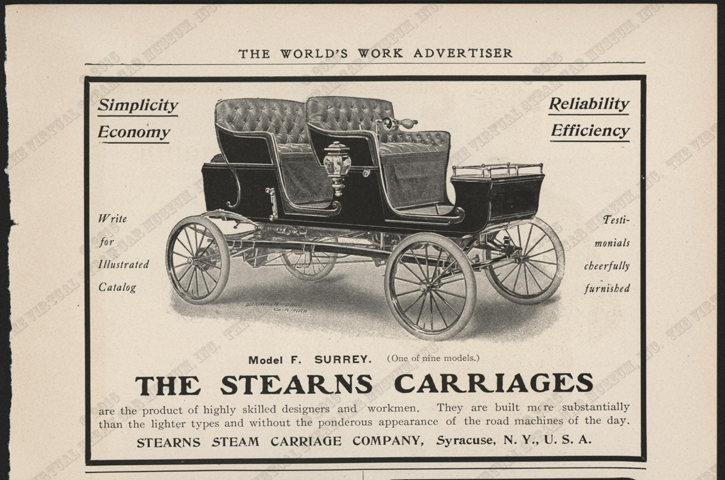 The Stearns 1903 advertising brochure. This is the January 25, 1903 New York Times reprint. 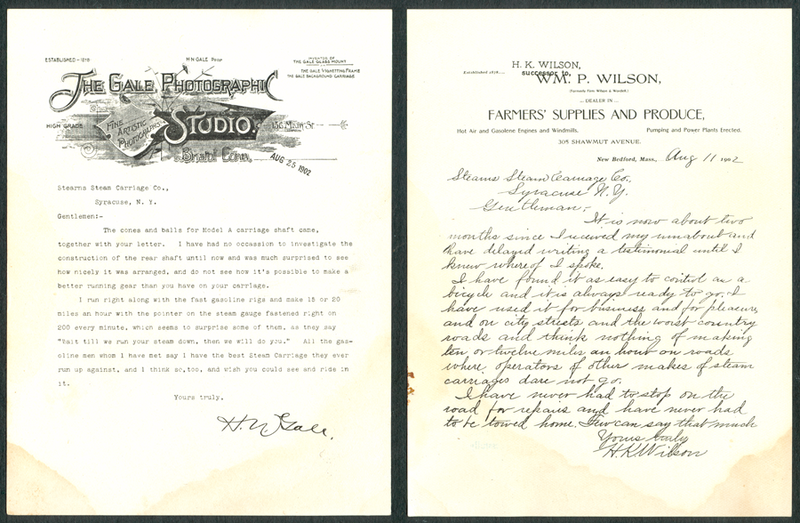 These six testimonials were printed on the customer's letterhead and accompanied the brochure above. 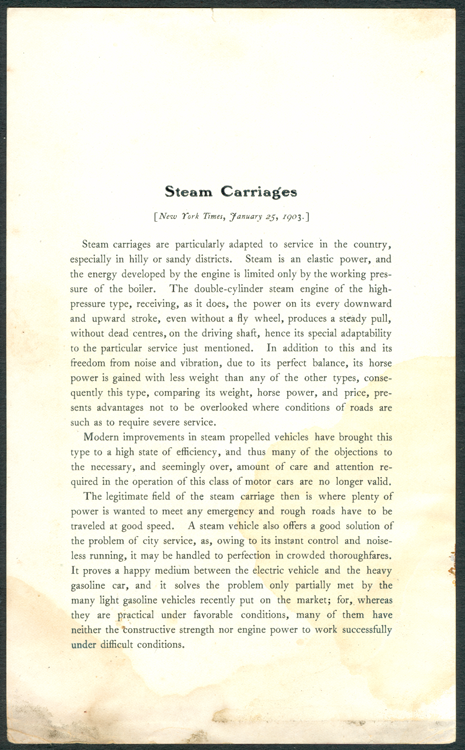 The Steam Automobile Club or America reprinted this Steaerns Steam Carriage Co. brocuhre. It is available for sale from SACA. Georgano, G. N., Encyclopedia of American Automobiles, (New York, E. P. Dutton & Co., 1968), p. 188.